Did you catch it? Are you in the 1%? Let's play! 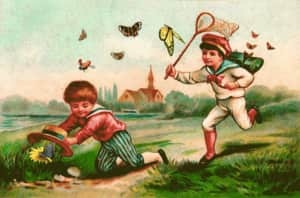 What a Beautiful Day for a Butterfly Catch! There is another butterfly hidden in this pastoral scene. Can you catch it before the monarch metamorphosis? It looks like Franz has spotted something! Can you see it too? Then catch it! WOW! Did you see that? It was practically invisible to the naked eye. They said that "Only 1% of People Will Catch The Hidden Butterfly In This Optical Illusion" and I did! 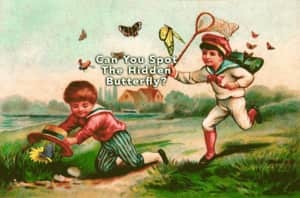 Can you catch it too? 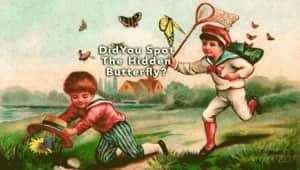 Did You Catch The Hidden Butterfly? YES! I saw it right away. I have love catching butterflies! No! I needed to see the reveal & I still don't see it! I am the butterfly and you can't catch me! I hate all bugs even butterflies! Eeeek!